For the martyr of 766 of the same name, see Andrew of Crete (martyr). 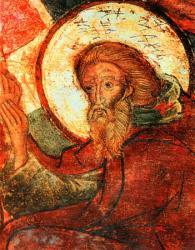 Saint Andrew of Crete (Greek: Ἀνδρέας Κρήτης, c. 650 – July 4, 712 or 726 or 740), also known as Andrew of Jerusalem, was an 8th-century bishop, theologian, homilist, and hymnographer. He is venerated as a saint by Eastern Orthodox and Roman Catholic Christians.